The title INTERSECT@CMU was chosen to signify the interconnected nature of the Carnegie Mellon campus and the multi-disciplinary approach necessary to address modern business challenges. During an interview with John Byrne, Editor-in-Chief of Poets & Quants, a publication devoted to business education, Sevin Yeltekin, Professor of Economics, Senior Associate Dean of Education, said, “If you are thinking about choosing a school to help you become a business leader, you need to choose a school that knows how to approach these important business problems in an interdisciplinary way.” Poets & Quants livestreamed the entire conference on its homepage, and Byrne interviewed about two dozen panelists and attendees during conference breaks. The event was organized by a program committee of students, staff, and faculty from across the Carnegie Mellon campus. It was chaired by Yeltekin and Alan Scheller-Wolf, Senior Associate Dean of Faculty and Research, Richard M. Cyert Professor of Operations Management. 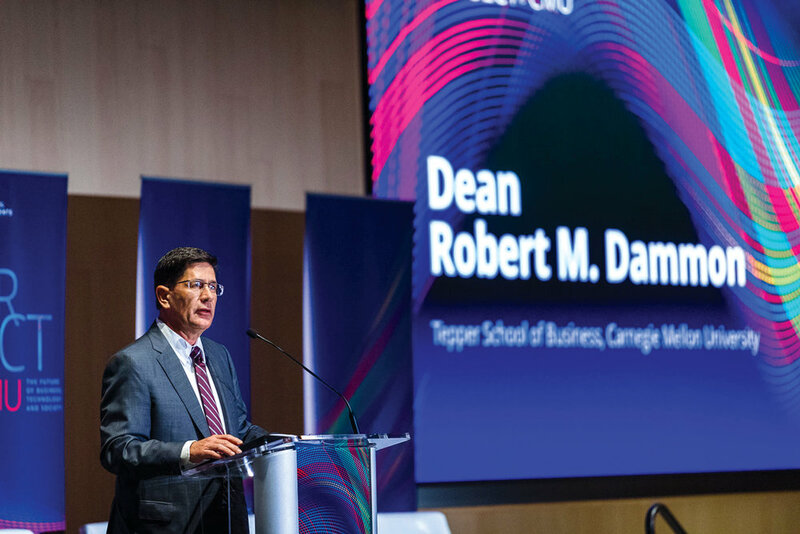 Over several months, the committee planned programming to highlight major contributions of Tepper School and Carnegie Mellon alumni and faculty to transformative innovations such as digital assistants, predictive modeling, human-computer interaction, and blockchain cryptography. As future conferences are planned, they will continue to highlight contemporary trends shaping business practice. The Tepper School is committed to staying at the forefront of these trends — the school recently announced the launch of the Tepper Blockchain Initiative, a collaboration among researchers and educators from within the Tepper School and across CMU whose work involves blockchain. Similar initiatives will be developed surrounding prominent topics where CMU and the Tepper School are thought leaders.